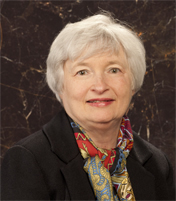 Editor's Note: Earlier this year we published Fed Vice Chair Yellen's speech, perhaps not the usual 'senior site's' fare, but then we're never influenced by popular subjects being generated by other sites. However Ms. Yellen is now being touted as a possible successor to that other speech-making Fed figure, Ben Bernanke, whose speech highlighting his background caught our attention years ago. "Grandma Friedman was a wonderful cook, and if you dig deep enough into the archives of the Charlotte Observer, you will find a large photo of a much younger me under the headline, “Ben Loves Grandma’s Blintzes,” together with her recipe for that dish. Unfortunately, my grandmother died when I was thirteen, and when my grandfather came to live with us in Dillon, the regular trips to Charlotte ended. I am pleased to say, though, that my connection to this city has since been re-established, as my parents have retired to Charlotte, and my brother (a lawyer in town) and his family live here, too. So I still feel like an honorary Charlottean as well as a Carolinian." With so many people today unable to find work, it might seem odd to highlight such an ambitious and distant goal for employment. I do so because the gulf between maximum employment and the very difficult conditions workers face today helps explain the urgency behind the Federal Reserve's ongoing efforts to strengthen the recovery. My colleagues and I are acutely aware of how much workers have lost in the past five years. In response, we have taken, and are continuing to take, forceful action to increase the pace of economic growth and job creation. In the three years after the Great Recession ended, growth in real gross domestic product (GDP) averaged only 2.2 percent per year. In the same span of time following the previous 10 US recessions, real GDP grew, on average, more than twice as fast — at a 4.6 percent annual rate.3 So, why has the economy's recovery from the Great Recession been so weak? The slow recovery was preceded, of course, by the deepest recession since the end of the Second World War. The bursting of an unprecedented housing bubble, together with the financial crisis that followed, dealt a huge blow to demand. These developments robbed homeowners of wealth built over a generation, impaired their access to credit, decimated retirement savings, and shattered the confidence of consumers. Businesses slashed capital spending and payrolls, and real GDP contracted by 4.7 percent, more than twice the average for the 10 other recessions since World War II. The Great Recession was also the longest postwar recession — it lasted 18 months, compared with an average of 10 months for the others. The experience of the United States and other advanced economies suggests that deeper recessions are usually followed by stronger-than-average recoveries. While it's also true that longer recessions tend to result in weaker recoveries, even after accounting for this factor, this recovery has been significantly weaker than past experience would have predicted. 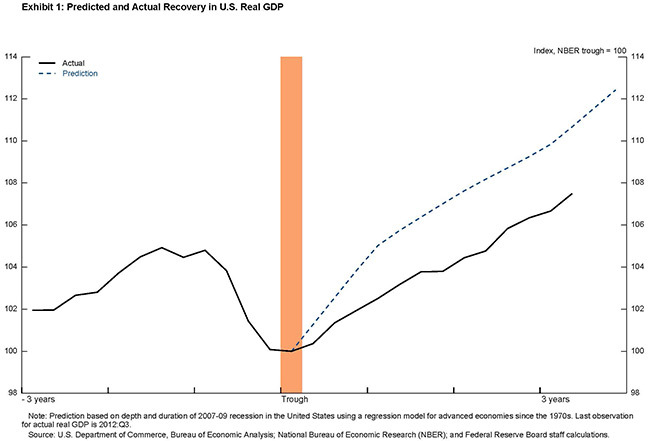 The dashed line in exhibit 1 shows how real GDP would have been expected to increase in this recovery, based on the experience of the United States and other advanced economies and given the depth and duration of the Great Recession.4 The gap between the actual and the predicted path of real output gives a sense of how much economic performance has lagged in this recovery. But the implications of this result may seem a little abstract, so let me illustrate the same idea in a way that tries to show the burden that workers continue to bear in this slow recovery. 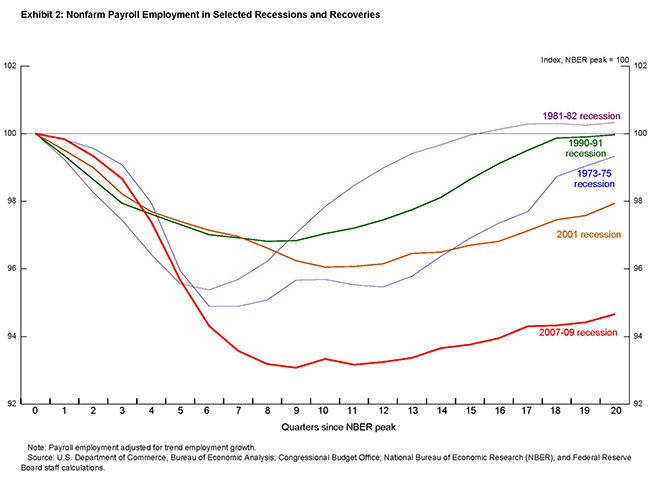 Exhibit 2 shows how employment has declined and recovered following several previous recessions. The employment measure attempts to control for the fact that demographic changes and other factors have altered the trend, or potential, workforce over the years. For example, in the 1970s, the pool of potential workers was expanding as baby boomers and an increasing share of women moved into the labor force, such that employment needed to rise relatively quickly just to absorb these additional workers. More recently, the aging of the population has put downward pressure on labor force participation, so employment hasn't had to grow as quickly to keep pace with the potential workforce. Even after making this adjustment, however, the Great Recession stands out both for the magnitude of the job losses that attended the downturn and for the weak recovery in employment that occurred after the recession ended.